So the question I get the most when I talk about using essential oils now is what my favorite ones are and how I use them (and if they work...). So here's my long answer! I bought the premium starter kit when I first started because it has all of the most popular oils and includes a diffuser (which is like a spa at home), and a bunch of other goodies like samples packets and more. 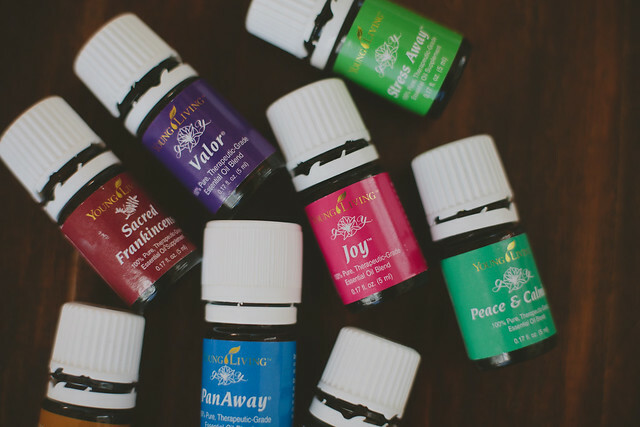 You save a ton of money by going this route and get your hands on 11 different oils to start out with, it was like christmas morning when my package arrived in the mail! So I'll start by talking about those ones that are included because thats all I had to begin with and they are the bees-knees! Thieves: This is a powerhouse oil and definitely one of my very very favorites! It is like emergen-C X 100 for helping ward off sickness. We've used this one over and over during cold and flu season to help keep us from getting sick or getting over sickness quickly. My favorite story (and the one that had me totally sold on it) is my entire family (parents, sisters, spouses, kids) stayed in a small house for a vacation recently and right in the middle of it my nephew got a stomach virus so we were all pretty much doomed to get it. I remembered that I had brought thieves so I started applying it to my feet and anyone in the house who would let me. Here's the kicker: everyone that let me apply the thieves to them didn't get the virus. The stubborn people who didn't want "the oils" on their feet, they got the nasty little virus. That CANNOT be a coincidence. Ever since then, we've been using it diligently if we find out we were around someone sick or start to feel the beginnings of a sickness and it has always nipped it in the bud. Other ways we use it: cleaning! All-natural anti-bacterial! Peppermint: I get headaches pretty frequently (it runs in the family) and I hate hate hate using pain relievers so when I read about peppermint relieving headaches I was super excited to try it. A drop of oil swiped across the temples and forehead (or back of neck, depending on where your head hurts) and gone. Sometimes I'll have to do it twice for it to go away completely but for the most part just once. It is also fantastic for stomach problems, we usually put a drop in a little bit of water and shoot it down. This is HUGE for me since I used to live off pepto (before I got pregnant) and it was the only thing that would take away my frequent stomach aches. If there was one oil I probably couldn't live without now, it'd be peppermint. Other uses: congestion, indigestion, muscle soreness, gas and fever reducer. Frankincense: This one is like gold to me! It has super restorative properties so I've been using it on my face to help with breakouts, heal old acne scars and keep wrinkles at bay. I actually just started using it on a couple stretch marks that I got while pregnant, and I know you won't believe me until I have photographic evidence but they are almost completely invisible. Pictures to come (when I feel like being vulnerable). This is a super expensive oil so that fact that it comes in this kit is incredible! Joy: This one smells incredible and has been super helpful for when I have anxiety or when I'm in a funk. I was super skeptical of essential oils helping out with emotional issues because the results aren't as black and white as a headache going away or a rash clearing up but they have worked for me in tangible ways. I have friends that have been able to get off of anxiety/depression medications because these work so well for them. And THAT is truly amazing! Plus, this one smells like the best perfume so its a win/win. Lemon: This one might be one of the most multi-purpose oils out there. Josh and I add a drop to our water bottle every day for its cleansing properties. I also use it to clean with, to cook and bake with (lemon cookies!) and if you get sick it is great with honey to help a sore throat! So many other uses too. Lavender: If you've been reading my blog for awhile you know how obsessed with lavender I am :) I loooove this one. I use it for relaxation and sleep (for myself and Beck! ), on burns and skin irritations, diaper rash, dry skin and lips (darn winter! ), to clear up a runny nose and I even add a drop to my coffee every now and then. It's also great for stress and anxiety and to use in laundry or homemade cleaning products to make everything smell so fresh. Panaway: This is the icy-hot of the essential oil world but so much better. I use it for tension headaches (a drop spread across back of my neck, behind my ears and across my shoulders), for sore muscles from working out, and the best of all, for stomach cramps around that time of the month. I would always have to take at least one ibuprofen for my cramps but haven't taken a single one since september. A few drops to my lower stomach where you feel cramps and it eases the pain and feels tingly and minty. Citrus fresh: This one is often used for weight loss but I've yet to try it for that so I mostly use it for cleaning, as an air spray (it smells SO refreshing), or in my water for an energy boost. This one is still new to me (its actually new to the kit) so I'm still learning about what to use it for. Melaleuca Alternifolia (Tea tree): I started using tea tree oil a loooong time ago because I always heard it helped with skin issues and such but it honestly never worked for me so I gave up. Looking back I can see it probably didn't work because I bought a $3 bottle at walmart or some place equally as shady and it probably didn't even have any actual Melaleuca(thats the real stuff) in it. Now that I use the real deal stuff it actually works like its supposed to. It is so amazing for a plethora of skin conditions, cuts and bug bites (and preventing bug bites! ), cleaning and preventing mold growth, relief from athletes foot, getting rid of warts, and even helping an earache. Maybe this one wins for most multi-purpose?! I had ring worm on my arm about a month ago (so gross I know!) and I wanted to get rid of it asap but without using a fungal cream so I used Mel-A a few times a day and it was gone within a week. Which is good because I was so creeped out by it! Wow. That was long and I only briefly touched on each one that I started out with! I have so many more specific stories (or testimonials if you will) to tell but I'll save it for later this week or next week so this doesn't turn into the longest post ever. If you're curious and need to know more.. like now! about any of these that I talked about, feel free to email me!! I'll be also posting more about which ones I feel comfortable using on Beck for sleeping, teething, fussiness, rashes, ect. soon but if you need to know right away (I feel your pain!) email me too, I'll tell you what has worked for us! 3. Go ahead and just say No Thanks for Step 3 about Essential Rewards. No need to worry about that right now. Follow the process all the way through to the end, where you will receive TWO confirmation emails! One confirming that you signed up, and another confirming your order. Be sure to let me know if you're ordering and I can send you a helpful handbook thingy I have that has toooons of information about the oils, usage ideas, and recipes for cleaners and lotions and lots of other exciting things. Thank you for doing this post. I've learned so much already! Saving up for my own starter kit! Nice... I love the idea of using oils... I don't really have that many. I had tea tree for a bit but I didn't see much difference. I love argan oil. I definitely need to get me some, probably lavender and 'stress away' and thieves! 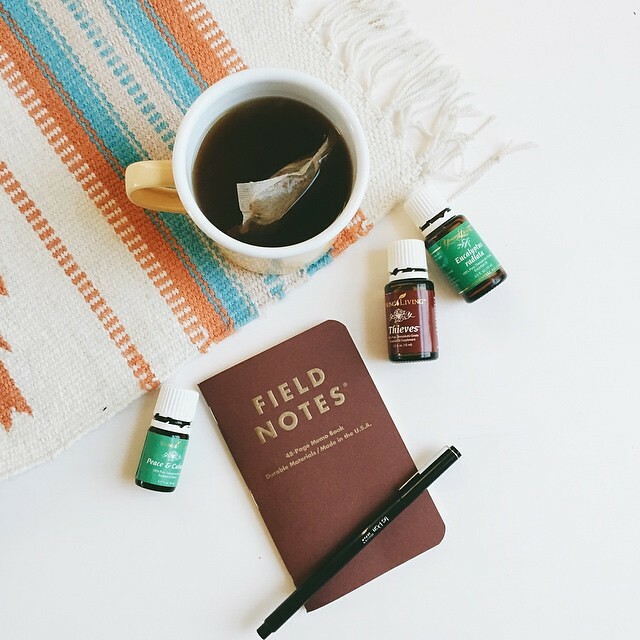 I love, love, LOVE essential oils and loved this post! You gave me a few new ideas to try! I use all of these oils and swear by Thieves!! Thanks for sharing! I have been wanting to get into essential oils but haven't known where to begin. This is incredibly helpful. I wonder if any of these oils would bring comfort to a baby who is teething? Clove oil works wonders! I paired that with an amber necklace and my son rarely had any discomfort with teething.